On 25th July, Friday, I got out of the house at around 11 a.m. to collect the reports of the supported students. i had planned to go to a lot of places on this day, right now, in Nepal people plan their schedule according to the quantity of petrol they have. Few days earlier, I had bought 5 litres of petrol by standing in a queue for 5 hours. I had petrol so I was planning to complete a lot of work. A one day journey from Kathmandu to Bhaktapur for collecting the reports reflects all the problems the country is facing at the moment.The reality has come up within these hours of my journey, from 11 a.m. to 7 p.m. 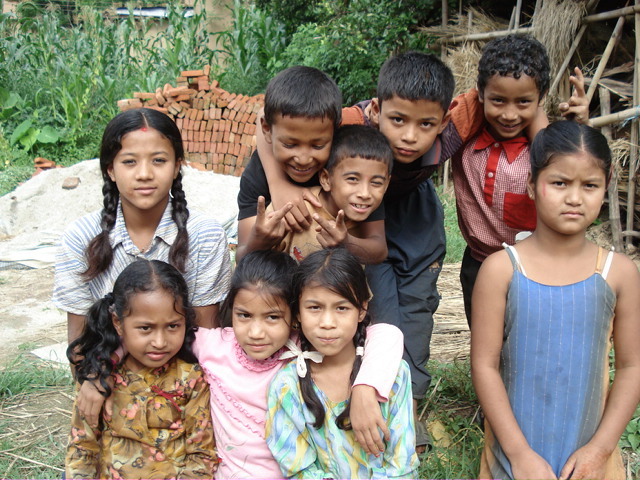 I headed towards Bhaktapur, Katunje to collect the reports of the supported students. There used to be traffic jam on the highway. But today, the road was clear. I was happy to ride freely on the road but at the same time I was sad to see the tired faces of the people who had been waiting for the bus for a long time. 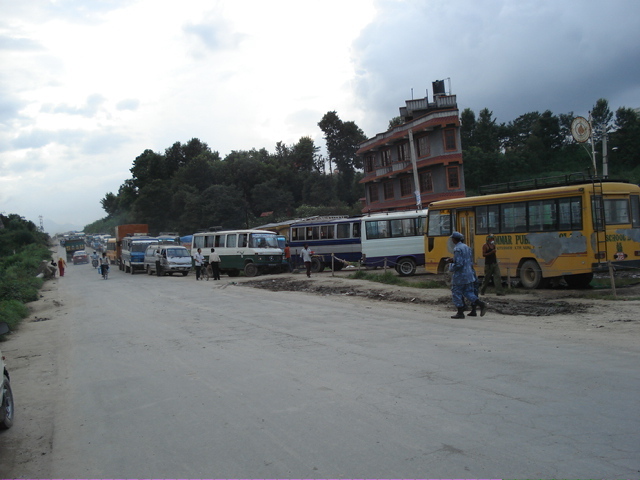 Due to fuel crisis, there were very few vehicles on the road. That is why, now days, it is very difficult for the people to travel here and there. After traveling for around 4 km, I could see a long cue of the buses and trucks. I thought there was an accident and I asked one of the drivers. He said they were waiting for the fuel. I further asked how long had he been waiting in a queue. his replied that he was there from the previous day. They were told that the diesel would come so all the diesel vehicles were there. There was the same situation a little farther, but the fuel had not yet arrived. I reached Little Boom’s school. Bishal Tamang is studying there with the support of Laligurans club. 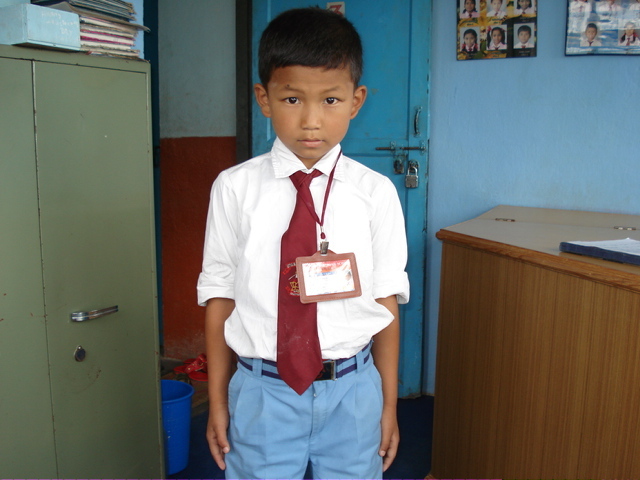 I talked to Bisahl Tamang and also to his teacher about his studies. I even saw his report card of the 1st term exam. He had scored less in English as compared to the previous exams. I asked the reason to his teacher and he said it could be because he has just changed the school and he is new. Maybe he will improve later. Later I went to Katunje Surya Deep School. The same scene for the fuel was seen on the way. At the school, I talked about the students’ studies with the teachers. The progress of Asha, Anup and Labin is satisfactory but Shristi is getting little weak. Later I gathered everyone to click the photo. Everyone came except Sristi. I asked the reason to the teacher. She lives a little far from the school, so uses a school bus. But due to fuel crisis, the bus service is not available. He said that it is in a queue and hopes to get the fuel in a day. I could not meet Shristi in the school so I wanted to meet her in her house. When I reached her house, in Katunje, the door was locked. I was more curious to meet her. I asked her neighbors and came to know that she had gone to play with her friends. I went to that place. She was playing and I called her to talk to her. I asked her where her mother was. She said that she has gone to work and will return around 6 p.m. Her parent are not at home when she is there and even after school she is more interested in playing. I think that is why her studies aer not going well. I thought of meeting her mother some other day to discuss about Shristi’s studies and left the place. Dadikot WEP class starts in the evening. But I went to teacher Subita’s house to know how the classes were going on. She was not in the house. She had gone to plant the crops in the field with her mother. In the field, there were women of WEP and many others plating the crops. (photo no. ) They were working in others’s field and not in their own. Women with low budget work in others’ field and get paid with which they run their daily life. Most of the women in WEP work in thefield during day to earn the wage and return home in the evening around 6 p.m. they cook and have dinner and go for WEP classes. They bring lunch form their house and eat around 2 p.m in one of the place near the field. (photo no ). That day, they had brought the pickle of potato and cucumber and chiura (chiura is parched rice,rice that has been pressed flat and dried,in japani language may be it is called ほしいい). I also ate with them. I talked about WEP during lunch. They said that they have to work in the field the whole day and get very tired when they reach home but still manage to go to the WEP classes. Teacher Subita said that some women reach home late after work,and all of them cannot attend the classes. Btu she teaches to those who are present. She has told that everyone would be attending regularly after this rainy season gets over. 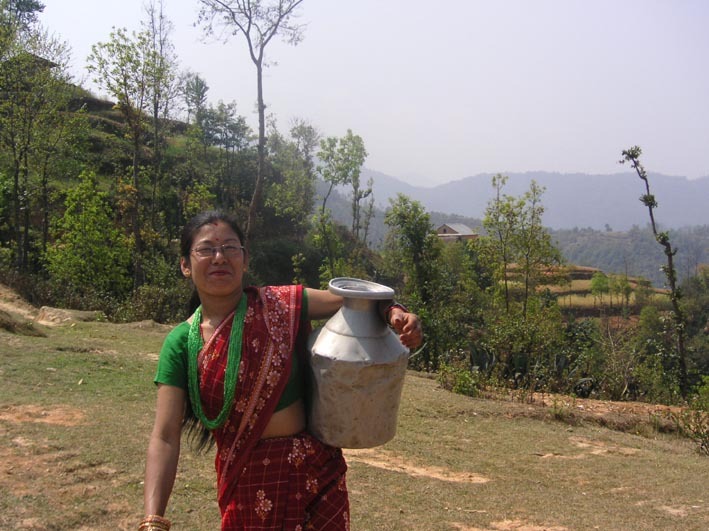 I even talked to the teacher, Man Kumari Tamang of WEP of Tamang village. The classes are going well but even here, all the women are not able to attend classes regularly, due to same problem.One emergency light is bought for Tamang Village WEP.So WEP is running well in Tamang village also. I was returning from Dadikot and saw a crowd of youths on the way, and I stopped to see. 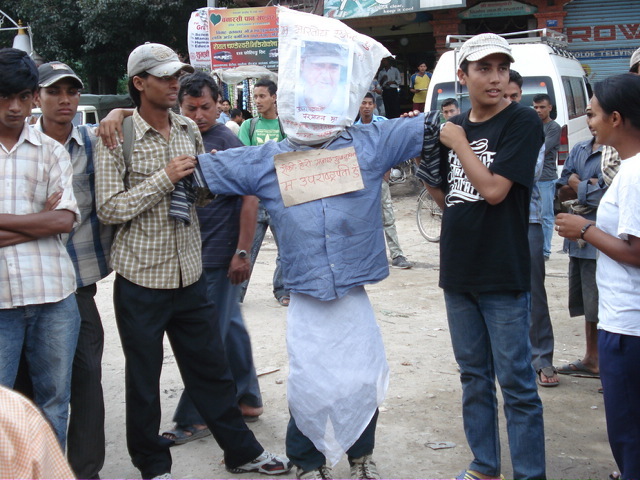 There was an effigy (putla) in the middle and people were protesting. . (effigy: a piece of cloth wrapped around a stick which resembles the person the people are going against. 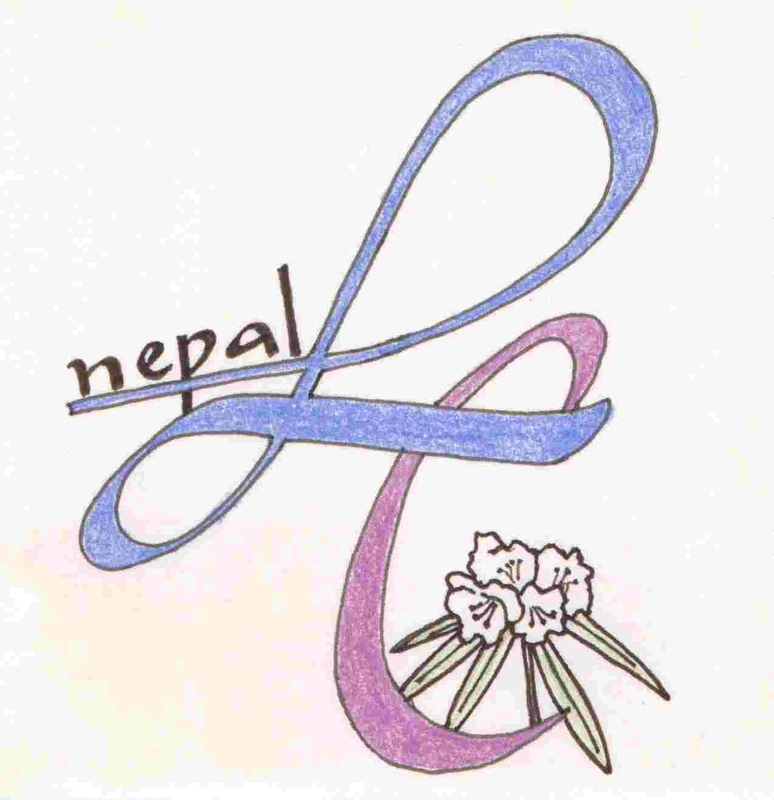 It is called putla in nepali. People burn this to show the anger.) Few days earlier, country’s first vice president,Paramananda Jha,did not take the oath in the Nepali language,he used Hindi language , so student organizations,civil society and ordinary people were demonstrating against him. These days, demonstration against him, burning tyres and effigy of vice president is going on. since vice president gave speech in hindi., he is accused of going against the nationality and the people are protesting on the roads. They are demanding for another oath in Nepali language.President read the oath to vice precident in Nepali but the vice president translated it and read in Hindi.People said that Jha insulted the national language.Before elected as vice president Mr.Jha was the leader of Tarai Janamukti forum. I came across another incident on the way. 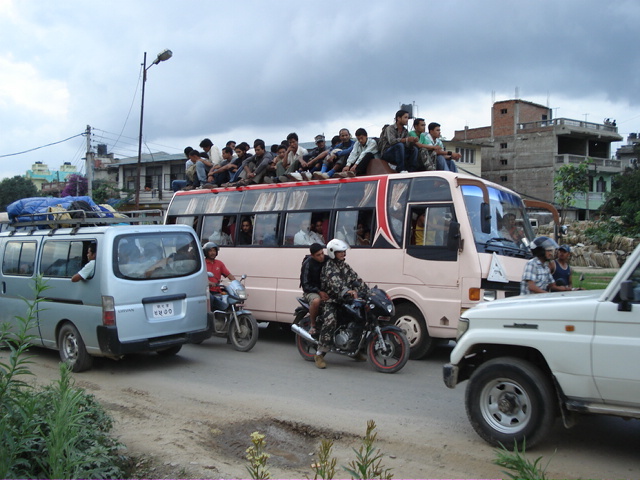 The bus coming to Kathmandu and leaving from Kathmandu were fully packed not only inside but on the roof as well. (photo no.7a ). Very few vehicles are running, so the passengers are forced to travel anyhow, even by sitting on the roof, to reach their destination. By looking at this incident, there comes a feeling that there is no traffic rules in the country. 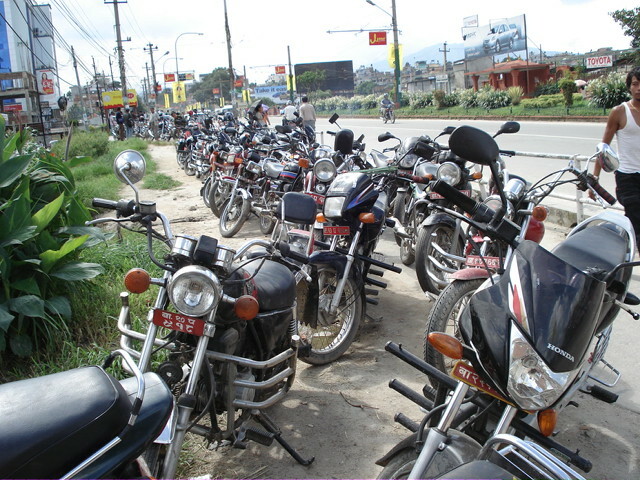 The queue of the bikes that I had seen while going to Bhaktapur was still there(Photo no.7b) and the petrol was still not available. They were hoping to get it by the end of the day. Most of the time of the Nepalese is just wasted in this things and there doesn’t seem to be any government looking after them. I also met Sharmila Bhattrai (the blind student who passed slc this year). Right now she is staying in NAB women hostel. I went to the hostel. Her family seems to be poor. They are altogether five sisters. One is already married. Among five, two of them are blind. She is the youngest of all. Another blind sister Namita is in the same hostel. She has just passed 12 and is getting ready for class 13. Altogether 13 blind and normal students gave slc from Namuna Machindra School this year.i was very glad to know that Sharmila has passed with the highest score among all. She has got 77.75%. since she has got a very good marks, she has planned to totally focus on her studies and keep music aside. I think her decision is right. I met her normal sister. 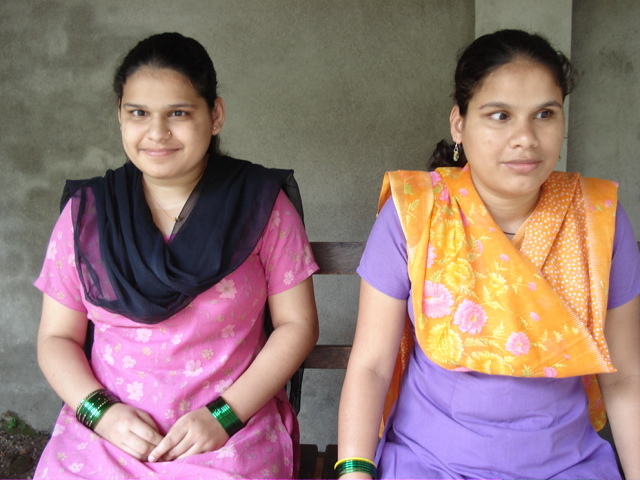 Besides those two blind sisters, other two normal sisters have passes 12 but did not continue their study. i wanted to know why? She said that, since their financial condition was not supportive, they could pay for the all. So being physically normal, they could survive anyhow. But it would be difficult for the blind to survive. So they decided to educate the two blind sisters. She said that if the blind sisters get support for studying, they would also wish to continue their studies. When I heard the sacrifice of the other sisters, I was very touched. In college, those two blind students study with the other normal students. They have to record whatever taught and revise in the hostel. But they said that they don’t have the money to buy the walkman and the cassette player.